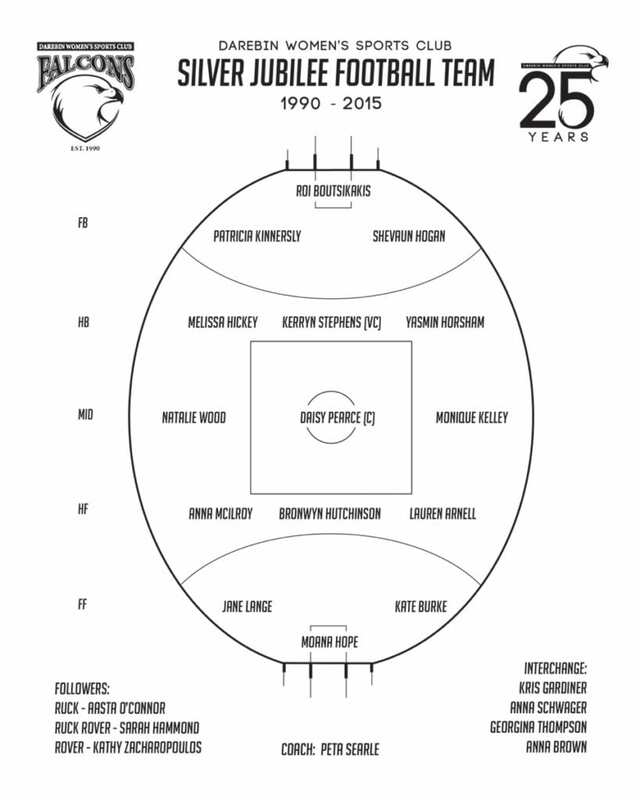 On Saturday July 4th the Darebin Women’s Sports Club announced its Silver Jubilee Football Team to mark our 25th anniversary. Louise Potter, Sal Rees, Kerryn Saunders and Julia Chiera made up the selection panel with the difficult task of selecting 22 players and one coach from the Falcons’ rich catalogue of talented and skilled past players/coaches. – Minimum 50 games played or coached (or minimum 5 years involvement as a player or coach) with the Falcons. – Captaincy of the Premier Division team. – State Representation whilst a Darebin Player. – VWFL League Best and Fairest or recipient of other VWFL awards whilst a Darebin Player. – Darebin Falcon Premier Division Best and Fairest or recipient of other Darebin awards. – Selection in the 2013, 2014, and/or 2015 Western Bulldogs or Melbourne Demons Women’s Teams.